Travelers’ and tourists visiting this beautiful part of Australia love the various surfing and beach activities available around Surfers Paradise. As the most popular travel destination in Queensland, Australia, Surfers Paradise is a great town to explore for couples and families alike. Exploring the town and its surrounds can be a much more relaxed experience when you have the freedom to come and go as you please with our Gold Coast car hire service. Surfers Paradises’ beautiful beaches and great surf have earned this city quite a reputation amongst surfers around the world. The huge waves and popular beach culture in the area draw thousands of tourists each year to experience Surfers Paradise's great atmosphere. A popular stop for tourists driving from Sydney to Brisbane along the Gold Coast, Surfers Paradise has something to offer anyone that loves the beach. An excellent way to explore these places is hiring a Brisbane car hire from the beautiful City of Brisbane. Arriving at the airport, Gold Coast airport car rental will give you the freedom to follow the area’s charming Nerang River as it meanders through the town. Hire a 4WD off-roader to explore the narrow area of sandy land caught between this river and the Coral Sea. Switch to a sporty convertible and experience the vibrancy of the main thoroughfare of Cavill Avenue with its popular souvenir shops, surf gear outlets, fashionable clothing boutiques and glitzy restaurants & bars. If you would prefer to relax on a quiet beach without the crowds, go for a drive further south to Broad Beach, Miami, Burliegh or Nobbys all the way towards Coolangatta. As one of the most popular Surfers Paradise Car Rental providers in the area, Select Rent A Car has a wide range of affordable rental cars for tourists - from economical sedans to people movers - to fit in the whole family. Select Rent a Car is open seven days a week to answer any of your enquiries. Convenient car pickups from airports make car rental as simple and convenient for you as possible. As the region’s preferred Car Hire Surfers Paradise company for over twenty years, we have handy accessories like baby seats, boosters’ seats, UBD maps and satellite navigational units available to hire. So go on, do enjoy the multitude of outdoor attractions in beautiful Surfers Paradise with your friends and family; made easier with our hire cars and helpful experts. 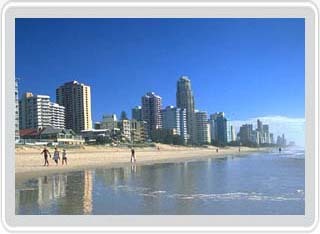 For more detailed information regarding our Surfers Paradise Car Rental, please contact us. Surfers Paradise Car Hire: for the list of available cars, please use the form located in the Select Rent A Car homepage. We also recommend the use of Cutprice Car Rentals for your Surfers Paradise Car Hire needs and Suncoast Car Rentals for your Car Rental Surfers Paradise requests.